MediaDefender and parent company ArtistDirect have had some serious setbacks recently. Last September they suffered a huge security breach when internal emails and a phone call were leaked to BitTorrent. They received even more bad press recently for DDoSsing Revision3. 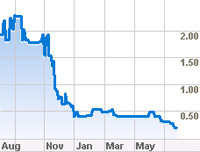 As a result, MediaDefender's parent company stock dropped from $2.00 down to just 16 cents. Mediadefender has had a rough year, and the future isn’t looking much better. Last month, MediaDefender lost one of its larger customers. The business accounted for roughly 18% of MediaDefender’s revenues. In a recent financial statement, the company stated that there is a decrease in interest for their anti-piracy services, and that the results of their p2p-advertising model are also disappointing. This news led to further decrease in the stock price, which was sitting at an all time low of just 16 cents this Monday. Surprisingly enough, the company structurally fails to mention the email leak and security breach, which has cost them a significant amount of money. In September 2007, disaster struck. MediaDefender had made many enemies with its anti-p2p activities. One of them decided to teach the company a lesson by hacking into their systems and leaking their internal emails and closest secrets to the Internet. The effect on the company and its operations was dramatic. In an interview with Portfolio, the hacker (using the pseudonym ‘Ethan’) explained how things led up to the leak. Ethan, a polite high-school student who lives with his family, was on his Christmas break when he first gained access to the anti-piracy company’s servers by exploiting a weakness in their firewall. This was at the end of 2006, at a time when business was still good for Media Defender with revenue standing at nearly $16m. Soon after that Ethan got access to the company’s email, its networked resources and even its telephone system. Logging in a handful of times each month through the summer of 2007, he started to get bored with ‘Monkey Defenders’ – his pet name for the anti-piracy outfit. Deciding to go out with a bang, he and the Media Defender-Defenders gathered thousands of the company’s internal emails and published them on web.